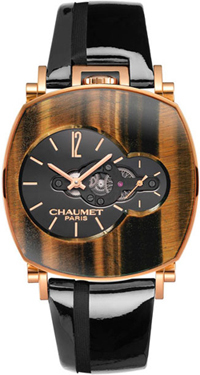 Watch brand Chaumet presented a new model watch Dandy Arty Open Face «Tiger’s Eye» Ref. W18893-42B, complementing the well-known collection of Dandy Arty. The new model Dandy Arty Open Face «Tiger’s Eye» Pincushion has 40×40 mm housing diameter, made of 18K 5N pink gold with semi-precious stones “tiger eye” on the flange. Crown in position 12:00 embellished with cabochon onyx. The dial itself is missing. To see the main mechanism of platinum, which is carefully polished and coated with PVD-coated black. It is also engraved with hour-markers in rose gold. New handles on the Swiss mechanical mechanism CP12V-V Agenhor Automatic, designed exclusively for Chaumet. Water resistant up to 30 hours meters. Supplied new Dandy Arty Open Face «Tiger’s Eye» Ref. W18893-42B on a patented black calf leather strap with black satin band. The strap is provided with folding buckle in pink gold with buttons security. Model released in a limited quantity of 12 pieces. Buy watch Dandy Arty Open Face «Tiger’s Eye» Ref. W18893-42B may be the official representatives of Chaumet.